Buying a flashlight isn’t a simple task these days. From Cree to Lumens, LED lights, and more, there’s a lot you must know in order to choose the best flashlight. Flashlights have come a long way from the inexpensive plastic devices from a couple decades ago. Today’s flashlights are super bright, durable, and have multiple light settings. If you need a flashlight but aren’t a flashlight expert, the terminology that surrounds these devices might seem a little intimidating. As your source for the best flashlights and flashlight accessories, we’ve explained some of the most popular flashlight-related terms. Hopefully, this will help you find the best tactical flashlight, best LED flashlight, or brightest flashlight you need at home or in the great outdoors. You’ve probably heard the term “Lumens” but what does “Lumens” mean? It’s a unit of measurement that’s used to describe how bright a flashlight is. (Watts is the term used to measure the amount of energy a flashlight uses.) Here’s what you need to know: The higher the number of Lumens, the brighter the flashlight will shine. Solid Signal carries flashlights and lanterns that range in power from 45 Lumens all the up to 4,000 Lumens! That a huge range of brightness from which you can choose the ideal flashlight. It really comes down to how much light you think you might need. If you’ve ever shopped for flashlights, you’ve no doubt encountered the term LED lights. An acronym for light-emitting diode, these tiny but powerful devices revolutionized flashlights. Older-model flashlights used small bulbs, which tended to be fragile and didn’t last very long. The typical lifetime of the average LED light, on the other hand, is 25,000-100,000 hours. LED lights are also much brighter tan conventional flashlight bulbs. We offer a variety of replacement LED lights and other flashlight accessories in our online product inventory. Technically, a tactical flashlight is any type of super-bright flashlight that attaches to a firearm or is used as a striking weapon or tool. (For example, they break windows in case of emergencies.) Because of these uses, tactical flashlights tools commonly used by soldiers and police. 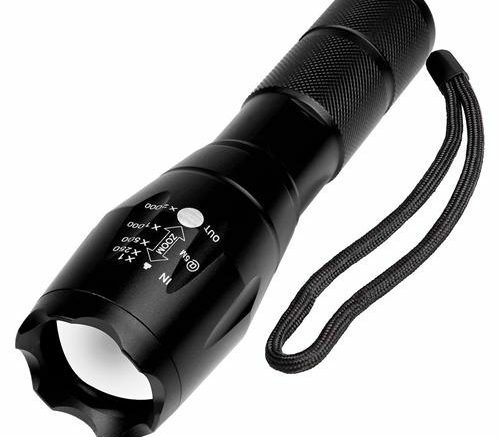 The need for super-bright flashlights that are durable has made tactical flashlights popular with the general public, as well. Most tactical flashlights tend to be very bright and are rechargeable. What Is a Cree Flashlight? A Cree flashlight isn’t really a flashlight. It’s a specific type of LED light used in many tactical and super-bright flashlights. Based in Durham, NC, Cree is a company that makes a variety of LED lights in several Lumen ranges and color variations. Solid Signal carries a handful of Cree flashlights. Today’s flashlights are so powerful and multi-faceted that the average store-bought battery doesn’t last long. This is why most of the newer flashlights are rechargeable. Most feature a special battery that that is recharged using a small unit that plugs into the wall. We carry USB rechargeable flashlights. Just plug them into your desktop or similar device. Some of these modern flashlights also can be powered with regular batteries, though you’ll get more usage from the rechargeable batteries. Where to Buy the Best Flashlight? You might be wondering how to choose the best flashlight for your needs. If you just want something to take with you on night walks or to use while working on the car, a keychain flashlight or headlamp that could do the trick. If you’re an avid outdoors person who enjoy hunting, camping, or hiking, we recommend a waterproof flashlight with a high Lumen count. In either case, we offer a wide variety of flashlights in our online product inventory. If you have any questions about our selection of flashlights, give us a call at 877.312.4547. Our team of product experts is ready to help you find the best flashlight.